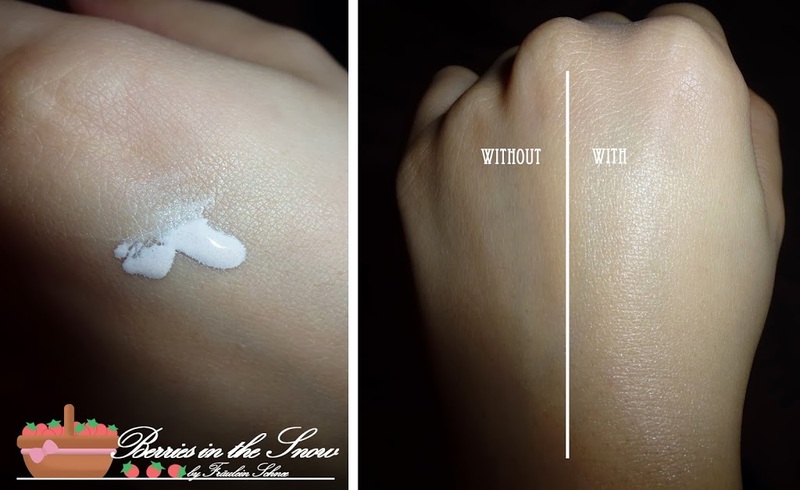 I’m a bit sceptical towards CC creams, especially towards those with color changing beads, because of the coverage which is just not enough for my liking. So, still I prefer using BB creams instead of CC creams, but nevertheless once in a while I’ll buy or try some CC creams or samples of CC creams. 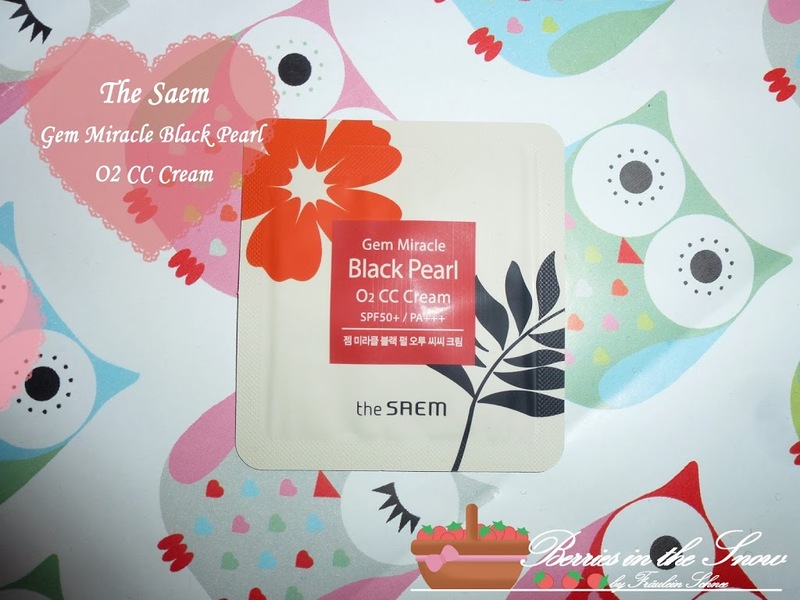 This time I tried The Saem Gem Miracle Black Pearl O2 CC Cream. This is also the first The Saem product I tried, although this brand offers some more products I would definitively love to try sometime. Since I only had samples of this CC cream, I cannot say much about the packaging, except that it comes in a jar/tube with a pump. The sample packaging looks attractive with the colorful motif on it. I think the same motif is depicted on the paper packaging of the CC cream tube. This CC cream has a white base and contains color changing beads in it. It feels very smooth upon application. This CC cream also contains a nice list of ingredients, mostly natural ones. You can look up the ingredients on COSDNA if you want to check them out first. The good point which I like a lot is, that it doesn’t contain parabens, mineral oil, talc, benzophenone, artificial color, PG or 3-ethonolamines, so people disliking these ingredients in their cosmetic might like this product as well. It has SPF 50+/PA+++, too, which supports anti wrinkle effects and prevents skin damage. As all CC creams it claims to have a lot of skin benefits and smoothen the skin. Honestly, I really enjoyed using this CC cream. It made the skin look nice and more even. It doesn’t have super cover like Missha’s Perfect cover BB cream, but it has more coverage than Skinfood’s Vita Water Drop CC cream. The finish is also not glowing like the Skinfood CC cream but semi matte. If you have dry skin make sure to use a moisturizer before, because it doesn’t provide that much moisture. 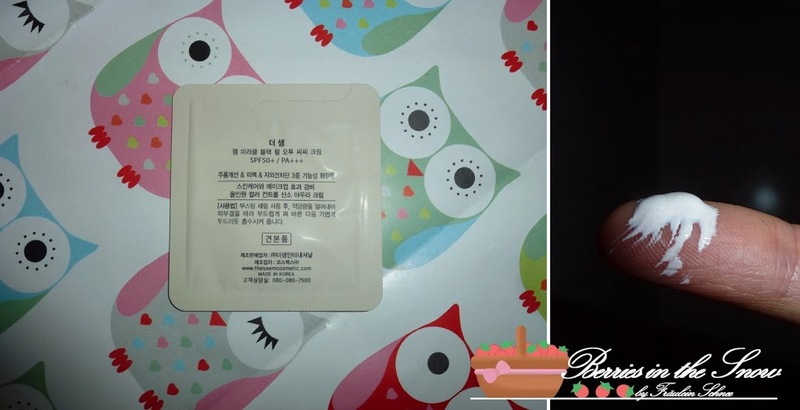 Below, you can see a comparison between this CC cream and the CC cream from Skinfood and The Faceshop’s CC cream I reviewed previously (you can enlarge the image by clicking). I tried using this CC cream with two different moisturizers and also combined it with primer beforehand and it looked really nice in all cases, especially with primer it just looked great all day long. I would definitively prefer this CC cream over the Skinfood cream. for more coverage I would still recommend The Faceshop Face It Aura CC cream. Did you try out this CC cream? Or do you still prefer BB creams? I prefer use both CC Cream and BB Cream, Btw I never tried before any product from THESAEM so this review is very useful. I have yet to try a CC cream But this may be my first one. Looks very nice! Thanks for the review! I haven’t found any must have CC creams yet, although I am looking at the one from Tony Moly. I’ll see if I can check this one out too. Seems like a good CC cream to try. The only one i’ve tried so far is by Tony Moly and it’s not too bad. Still, I would love to try the face shop cc cream because it seems to have a nice coverage.